Moose are excellent and powerful swimmers. Especially to reach aquatic plants, they dive down to 6 meters and up to 40 seconds long! Usually they do so to harvest underwater vegetation. Many marvellous pictures are showing moose emerging from a sea, water flooding from their antlers. They can swim 10-20 km out to lakes and ocean non-stop with a speed of up to 8 km/h! Generally the long legs are excellent to step over logs or bushes of 60-90cm height or master middle deep snow up to 50cm. This is their main advantage compared to their predators such as wolves: Moose just easily step over an obstacle, while wolves have to jump or run around it - Valuable time and energy saving for the escaping moose. This is also a main reason moose are seldomly in free areas, but e.g. in the woods. They usually walk silently and slowly with teetering head - a floating motion. Average speed is 10 km/h, which they cannot maintain in thicket due to their wide antlers. They can also trot somewhat stiff-legged. As they usually can overcome obstacles just with their long legs they jump seldomly. Usually moose walk. Fastest motion is the gallop, which is mainly used to escape in threatening situations. In deep snow (more than 1m), where also their long legs cannot help any longer, moose can get helpless and stuck in lightly packed snow - not able to defend themselves againts predators. 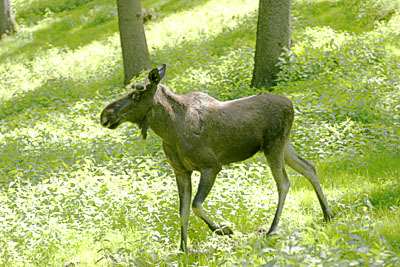 In general moose can trample down snow and also dig up to 40 cm deep into the snow on the search for low growing plants. In winter time moose often use frozen lakes and other surfaces of water as new paths, risking to brake in if the ice is not yet or no longer thick enough to carry their weight. 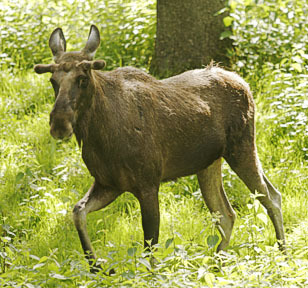 Moose are most active in late evening, but can be seen the whole day long. And if they are not moving ? Moose actually lie down to sleep and often sleep during sunshine hours.